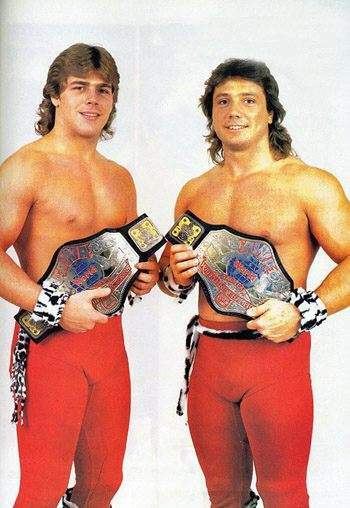 Marty Jannetty & Shawn Michaels formed a very exciting high-flying tag team known as the Midnight Rockers..
May 15, 1986: The Midnight Rockers defeated Brad & Bart Batten for the Central States Tag Team titles..
April 20, 1986 – WrestleRock: Doug Somers & Buddy Rose defeated The Midnight Rockers (Marty Jannetty & Shawn Michaels)..
June 28, 1986 – Battle by the Bay: Marty Jannetty & Shawn Michaels & Curt Hennig beat Rose & Somers & Alexis Smirnoff..
December 25, 1986 – Brawl in St. Paul: The Midnight Rockers defeated Buddy Rose & Doug Somers in a “Steel Cage” match..
January 27, 1987: The Midnight Rockers captured the AWA World Tag Team title by defeating Buddy Rose & Doug Somers..
May 2, 1987 – SuperClash II: Ray Stevens & Shawn Michaels & Marty Jannetty beat Buddy Wolfe & Doug Sommers & Kevin Kelly.. The Midnight Rockers also worked in Memphis CWAand even had a stint as heels. Summer 1987: The Midnight Rockers joined the WWF, but were fired 2 weeks later for “partying too hard”..
December 27, 1987: The Midnight Rockers beat Randy Rose & Dennis Condrey for their 2nd AWA World Tag Team titles in Vegas. 1988: Shawn Michaels & Marty Jannetty resigned with the WWF and became known simply as “The Rockers”..
June 18, 1988 – Superstars: The Rockers defeated Iron Mike Sharpe and The Intruder. June 19, 1988 – Wrestling Challenge: The Rockers defeated Steve Lombardi and Terry Gibbs. July 3, 1988 – Wrestling Challenge: The Rockers defeated The Conquistador and Terry Gibbs. July 16, 1988 – Superstars: The Rockers defeated Steve Lombardi and Terry Gibbs. July 24, 1988 – Wrestling Challenge: The Rockers defeated Iron Mike Sharpe and Chris Duffy. July 30, 1988 – Superstars: The Rockers defeated Pete Sanchez and Rick Gantner. August 7, 1988 – Wrestling Challenge: The Rockers defeated Dave Wagner and Tom Burton. August 20, 1988 – Superstars: The Rockers defeated Al Navarro and Trent Knight. September 4, 1988 – Wrestling Challenge: The Rockers defeated Larry Stephens and Dusty Wolfe. October 8, 1988 – Superstars: The Rockers defeated Sandy Beach and Rusty Riddle. October 16, 1988 – Superstars: The Rockers defeated Bubba Kirk and Tom Burton. October 16, 1988 – King of the Ring: Shawn Michaels and Marty Jannetty both lost their first round matches..
October 29, 1988 – Superstars: The Rockers defeated Brian Costello and Sandy Beach. October 30, 1988 – Wrestling Challenge: The Rockers defeated Iron Mike Sharpe and Steve Lombardi. November 12, 1988 – Superstars: The Rockers vs. The Fabulous Rougeaus ended in a double disqualification. November 19, 1988 – Superstars: The Rockers defeated Gene Ligon and George South. November 24, 1988 – Survivor Series: The Rockers made their PPV debut in the Tag Team elimination match..
November 27, 1988 – Wrestling Challenge: The Rockers defeated Gene Ligon and Larry Stephens. December 10, 1988 – Superstars: The Rockers vs. Arn Anderson and Tully Blanchard ended in a no contest. December 25, 1988 – Wrestling Challenge: The Rockers defeated Jose Estrada and Iron Mike Sharpe. January 15, 1989 – Royal Rumble: Shawn Michaels & Marty Jannetty both participate in the Royal Rumble match..
January 22, 1989 – Wrestling Challenge: The Rockers defeated Dale Veasey and Bob Blake. February 4, 1989 – Superstars: The Rockers defeated Bob Blake and Dusty Wolfe. February 12, 1989 – Wrestling Challenge: The Rockers defeated Ross Browner and Danny Davis. February 18, 1989 – Superstars: The Rockers vs. Arn Anderson and Tully Blanchard ended in a no contest. March 5, 1989 – Wrestling Challenge: The Rockers defeated Louie Robinson and Chris Duffy. March 11, 1989 – SNME: Brain Busters (Anderson & Blanchard) vs The Rockers ended in a double count-out..
March 18, 1989 – Superstars: The Rockers defeated Iron Mike Sharpe and Mitch Casey. April 2, 1989 – WrestleMania 5: The Twin Towers (The Big Bossman & Akeem) defeated The Rockers..
April 15, 1989 – Superstars: The Rockers defeated Danny Davis and Barry Horowitz. April 23, 1989 – Wrestling Challenge: The Rockers defeated Chris Duffy and Glen Royal. May 6, 1989 – Superstars: The Rockers defeated Boris Zhukov and George South. May 21, 1989 – Wrestling Challenge: The Rockers vs. The Fabulous Rougeaus ended in a no contest. June 10, 1989 – Superstars: The Rockers defeated Chris Curtis and Jake Milliman. June 18, 1989 – Wrestling Challenge: The Rockers defeated Boris Zhukov and Tom Stone. July 2, 1989 – Wrestling Challenge: The Rockers defeated Tom Stone and Barry Horowitz. July 8, 1989 – Superstars: The Rockers defeated Tony Burton and Dusty Wolfe. July 22, 1989 – Wrestling Challenge: The Rockers defeated Smitty Austin and Mike Williams. August 5, 1989 – Superstars: The Rockers defeated Boris Zhukov and Sandy Beach. August 20, 1989 – Wrestling Challenge: The Rockers defeated Allen Kinsey and Chris Duffy. August 26, 1989 – Superstars: The Rockers defeated The Black Knight and Tim Patterson. August 28, 1989 – Summerslam: The Rougeau Brothers & Rick Martel defeated The Rockers & Tito Santana..
September 3, 1989 – Wrestling Challenge: The Rockers defeated Steve Vega and The Brooklyn Brawler. October 8, 1989 – Wrestling Challenge: The Rockers defeated Al Burke and Tom Stone. October 10, 1989 – WWF in the UK: The Rockers defeated The Rougeau Brothers (Jacques & Raymond)..
October 28, 1989 – Superstars: The Rockers defeated Ken Arnold and Mike Scarberry. October 31, 1989 – Saturday Night Main Event: The Rockers defeated Tully Blanchard and Arn Anderson in a best 2 out of 3 falls match. November 12, 1989 – Wrestling Challenge: The Rockers defeated Barry Hardy and Alan Reynolds. November 23, 1989 – Survivor Series: The Rockers joined the Ultimate Warrior’s Team against The Heenan Family.. The Ultimate Warriors (Jim Neidhart, Marty Jannetty, Shawn Michaels and The Ultimate Warrior) defeated The Heenan Family (Andre The Giant, Arn Anderson, Bobby Heenan and Haku) in a Survivor Series tag team elimination rules match. December 2, 1989 – Superstars: The Rockers defeated Conquistador Uno and Barry Horowitz. December 16, 1989 – Wrestling Challenge: The Rockers defeated Dale Wolfe and The Brooklyn Brawler. December 24, 1989 – Wrestling Challenge: The Rockers defeated Larry Lawson and Tony Burton. January 7, 1990 – Superstars: The Rockers defeated Arvil Hutto and Pat Rose. January 13, 1990 – Superstars: The Rockers defeated Lee Peak and Mike Davis. January 21, 1990 – Royal Rumble: Shawn Michaels & Marty Janntty both participated in the Royal Rumble..
Februar 4, 1990 – Wrestling Challenge: The Rockers defeated George South and Mike Davis. February 17, 1990 – Superstars: The Rockers defeated Allen Martin and Pez Whatley. March 24, 1990 – Superstars: The Rockers defeated The Brooklyn Brawler and Buddy Rose. April 1, 1990 – WrestleMania 6: The Orient Express defeated The Rockers by count-out..
April 28, 1990 – SNME: The Hart Foundation vs The Rockers went to a double disqualification when Demolition interfered..
April 29, 1990 – Wrestling Challenge: The Rockers defeated Paul Diamond and Sonny Austin. May 5, 1990 – Superstars: The Rockers defeated Al Polic and Chris Duffy. May 19, 1990 – Superstars: The Rockers defeated Boris Zhukov and Nikolai Volkoff. May 27, 1990 – Wrestling Challenge: The Rockers defeated Boris Zhukov and Nikolai Volkoff. June 10, 1990 – Wrestling Challenge: The Rockers defeated Tim Jergen and Tom Bennett. June 16, 1990 – Superstars: The Rockers defeated Tom Stone and Tony Leone. July 1, 1990 – Wrestling Challenge: The Rockers defeated The Brooklyn Brawler and Paul Diamond. July 21, 1990 – Superstars: The Rockers defeated Al Burke and Bob Bradley. July 28, 1990 – Saturday Night Main Event: Tag team champions Demolition defeated The Rockers to retain the titles. August 12, 1990 – Superstars: The Rockers defeated Iron Mike Sharpe and Spike Jones. August 18, 1990 – Superstars: The Rockers defeated Tom Bennett and Black Bart. August 27, 1990 – SummerSlam: Power & Glory (Hercules & Paul Roma) defeated The Rockers (Michaels & Jannetty)..
October 1990 – SNME: Shawn Michaels & Marty Jannetty won the Tag Team titles from Bret Hart & Jim Neidhart..
~~~Neidhart had been fired and was filling contractual obligations, which including jobbing the titles to another team..
~~~During the match, the top rope broke causing a bit of confusion and the Rockers winning the match..
~~~The Rockers defended the titles for a week after that, but then Neidhart was re-hired by the WWF..
~~~Vince McMahon decided that the title change never actually happened..
~~~To exlain, a story was sent to Pro Wrestling Illustrated about the rope break causing an “unfair working environment”..
~~~The title reign was annulled, and forgotten..
~~~The title change was edited out of the Main Event broadcast, and thus went down in history that the Rockers never had the belt..
October 27, 1990 – Superstars: The Rockers defeated Buddy Rose and Kent Carlson. December 30, 1990 – Wrestling Challenge: The Rockers defeated JT Smith and Tom Stone. January 19, 1991 – Royal Rumble: The Rockers defeated The Orient Express (Kato & Tanaka w/Mr. Fuji)..
March 2, 1991 – Superstars: The Rockers defeated Jerry Oates and The Brooklyn Brawler. March 17, 1991 – Wrestling Challenge: The Rockers defeated Dale Wolfe and John Allen. March 24, 1991 – WrestleMania 7: The Rockers defeated Barbarian & Haku w/Bobby Heenan in Los Angles, California..
April 6, 1991 – Superstars: The Rockers defeated Pez Whatley and Jeff Sword. April 14, 1991 – Wrestling Challenge: The Rockers defeated Mike Ming and Louie Spicolli. April 24, 1991 – UK Rampage: The Rockers (Shawn Michaels & Marty Jannetty) defeated The Orient Express..
April 27, 1991 – Superstars: The Rockers defeated Barry O and Scott Lucas. May 4, 1991 – Superstars: The Rockers defeated The Nasty Boys by disqualification. May 19, 1991 – Wrestling Challenge: The Rockers defeated Brian Costello and Dan Johnson. May 25, 1991 – Superstars: The Rockers defeated Al Burke and Bob Bradley. June 9, 1991 – Wrestling Challenge: The Rockers defeated Tom Stone and Tom Bennett. July 14, 1991 – Wrestling Challenge: The Rockers defeated Billy Gatlin and Louie Spicolli. August 3, 1991 – Superstars: The Rockers defeated Ed Moretti and Mike Roselli. August 8, 1991 – Wrestling Challenge: The Rockers defeated Jim Peterson and The Black Knight. September 28, 1991 – Superstars: The Rockers defeated Barry Hardy and Duane Gill. October 3, 1991 – WWF at Royal Albert Hall: The Nasty Boys defeated The Rockers..
October 13, 1991 – Wrestling Challenge: The Rockers defeated Brian Donahue and Mike Midland. October 19, 1991 – Superstars: The Rockers defeated Joe Milano and Von Krus. November 3, 1991 – Wrestling Challenge: The Natural Disasters defeated The Rockers. November 16, 1991 – Superstars: The Rockers defeated Barry Horowitz and Mark Buenavera. November 24, 1991 – Wrestling Challenge: The Rockers defeated The Brooklyn Brawler and Kato. November 27, 1991 – Survivor Series: Shawn Michaels walked out on Marty Jannetty during the final moments of the Survivors match..
December 21, 1991 – Superstars: The Rockers defeated Brian Donahue and Barry Hardy. December 28, 1991 – Superstars: Tag team champions The Legion of Doom defeated The Rockers to retain the titles. 1992: The Rockers broke up after Shawn Michaels tossed Marty Jannetty through the window of Brutus Beefcake’s “Barber Shop”. May 17, 1993 – RAW: Marty Jannetty defeated Shawn Michaels to win the Intercontinental title..
June 6, 1993: Shawn Michaels defeated Marty Jannetty to regain the Intercontinental title..
July 19, 1993 – RAW: Shawn Michaels defeated Marty Jannetty..
January 22, 1994 – Royal Rumble: Marty Jannetty entered at #29 and was eliminated by Shawn Michaels..
July 1, 1996 – RAW: Shawn Michaels defeated Marty Jannetty. March 14, 2005 – RAW: The Rockers (Shawn Michaels & Marty Jannetty) defeated La Resistance (Rob Conway & Sylvain Grenier).